Wildwood High School culinary instructor Stephen Serano shows senior Charles Collier, 17, techniques to prepare pasta. Collier aspires to be a chef. Students in Serano’s culinary class learn cooking skills that can be used in the home. Students also can eat the dishes they make — and the extra food is taken home so nothing goes to waste and families can be fed. Wildwood High School industrial arts teacher Mike Crane, center, works with students in an after-school program to build plan-ters the school will use to grow fresh vegetables for use in the school and for students to take home. Students, from bottom left, are Julio Rivera, 15, Josh Gilbow, 14, Sebastian Rivera-Santos, 14, Alison Snyder, 13, and inside the box is Wendy Tlayoa, 14. Nicole DeMarco, school nurse for the Wildwood School District, stocks the food pantry of the Glenwood Ave Elementary School, with non-perishable food items. 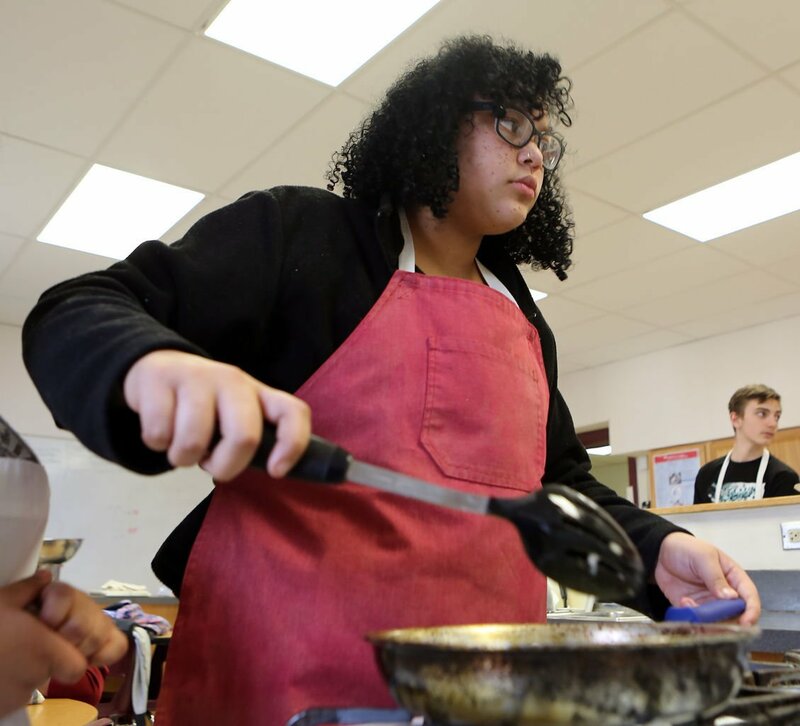 WILDWOOD — Leftovers never go to waste in Chef Stephen Serano’s cooking classes in the Wildwood School District, where almost half the students live in poverty. In his first year teaching at the high school, Serano quickly learned the signs that a child is not getting enough food. His “Freesyle Friday” classes are designed to use whatever is left in the fridge. Students are free to take leftovers home. “We can serve 10 or 15 people on stuff no one else would think about using,” Serano said. Winter in Wildwood is a lean season for families struggling to survive until the return of tourists and jobs. More than 46 percent of Wildwood’s children live in poverty, the highest rate in New Jersey, according to the U.S. Census American Community Survey. So many children are eligible for the federal free meal program that the district is one of a handful in the state that also offers dinner, and provides free breakfast and lunch to every student. One refuge for families is the school district, where everyone from cafeteria workers to the superintendent are filling the gaps and trying to lay the foundation for a better future. Industrial arts students learn construction skills by building a tiny home and urban garden boxes to grow produce for the culinary program. Excercise and sewing classes are part of the after-school program. So is a NASA challenge to design a space exploration vehicle. Students can arrive as early as 7:15 a.m. for breakfast and stay for after-school programs that include dinner at 5 p.m. In between they have teachers who watch for the child who arrives on a cold day with no coat. Coats, shoes and food are among the school nurse’s supplies. Cecilia Zalkind, executive director of Advocates for Children of New Jersey, said she is inspired by schools that recognize the importance of meeting all of a child’s needs. Wildwood industrial arts teacher Michael Crane has planned 15 urban garden boxes. They will grow strawberries, lettuces, broccoli and summer fare such as peppers, tomatoes and herbs for a summer cooking program. “We are teaching kids real-world career skills so they can provide for themselves and not just run to McDonalds,” he said. Students had to design and price the cost of the materials. They are now building. The next step is applying for a grant for a greenhouse. About 50 students registered for Serano’s cooking class. Justin Soto, 18, said he doesn’t cook at home but wanted to learn. His favorite part has been learning to make different sauces. Trayvon Young, 18, is one of the oldest in a family of eight. He cooks at home, though mostly what his mom tells him. He likes learning to follow recipes. For Serano, who is also the chef at Cafe Loren in Avalon, showing children different foods is one of his goals. When the school day ends, more than 100 students in fourth through eighth grades stay at the high school for an after-school program funded by a federal 21st Century Community Learning Center grant. They snack on juice and crackers, do homework, spend time outside or in the gym, then return for classes in sign language, sewing, cooking, instrumental music lessons, theater, karate, Zumba and the marbles team. Jen Loper teaches an after-school and summer cooking program that includes budgeting. Students made a cookbook last summer. “We set the table, eat together, and talk about the day, just like a family,” Loper said. In the cafeteria, Danuta DiPietro finished her lunchtime and crossing guard duties and was warming Chinese chicken, rice and broccoli for dinner. With the district for 16 years, she knows most of the children she feeds. Her nachos with ground turkey and cheese are especially popular. “It’s always a hot dinner,” she said. DiPietro averages at least 100 students for dinner, including some high school students who stop in after sports practice or just out of habit from their middle school days. Last year 320 people attended a family event. DiPietro almost ran out of food. Some students skip dinner but grab an apple or pear and a milk for home. Others said the school meal will be their dinner. There won’t be another meal at home. The school has received financial support from groups including the Christ Child Society, Mustard Seed Foundation, Fraternal Order of Police, and the Lunch with Lynch Foundation. Founder John Lynch joined a recent dinner to play a game with students for the chance to win a Kindle Fire or gift certificates to Acme and Domino’s Pizza. “It can make a big difference for a family to get a free pizza on a Friday night,” he said. 516,824: Number of N.J. school children eligible for free or reduced-fee lunch in 2015-16. $98 million: Amount in federal funds NJ schools received to subsidize breakfast for low-income children in 2016. Percent of school children eligible for federally subsidized meals. ATLANTIC CITY — Nicole Fischer’s hands moved methodically, chopping lettuce and tomatoes as a one-woman assembly line on taco night at her home. How healthy is your South Jersey county? How healthy is the county in which you live? A new report shows progress in health and economic well-being among New Jersey’s 2 million children stems in part from federal safety-net programs.